Heat 2 teaspoons oil in 10-inch skillet over medium-high heat. Cook pork in oil 6 to 8 minutes, stirring frequently, until no longer pink in center. Shake reserved pineapple juice, rice vinegar, oil, hoisin sauce and gingerroot in tightly covered container. Mix pineapple tidbits, pork and remaining ingredients in large bowl. Drizzle with dressing; toss. Serve immediately. If you can't find the teriyaki-flavored pork tenderloin, purchase a plain tenderloin and generously brush it with teriyaki sauce before cutting into strips. Looking for an easy way to save some time? 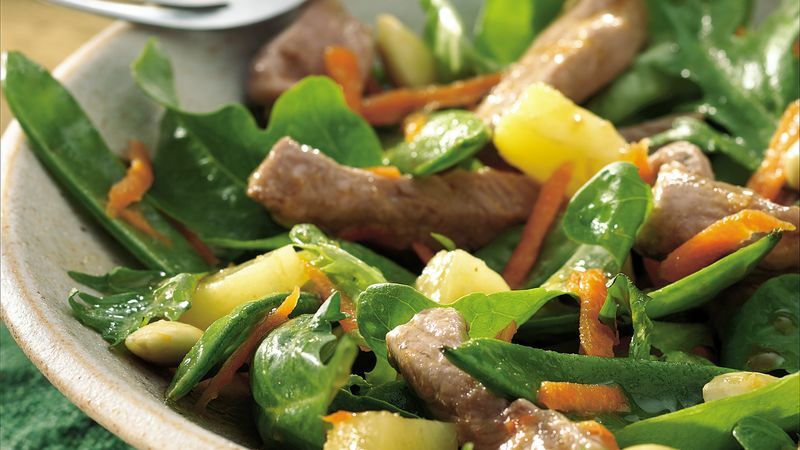 Purchase a bag of torn mixed greens or a salad mixture including carrots. Also, check the salad bar for pea pods and shredded carrots. For extra crunch and eye appeal, sprinkle the salad with chow mein noodles before serving, or put out a small bowl of noodles and let guests serve themselves.